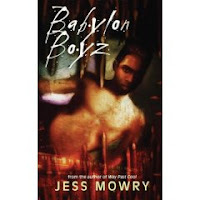 Three African American best friends are growing up in the inner city ghetto of Babylon. Pook is 14, Gay and out. Wyatt, 13, is seriously overweight. Dante, also 13, was born to a drug-addicted mother, and needs a heart operation or he'll die. The boyz find some illegal drugs. Lots of drugs. Worth a hell of a lot of money. Pook and Wyatt want to help their friend. All three of them want to get out of Babylon. But if they sell the drugs to get the money they need, they know they'll be feeding the destruction of their community. They see the costs of it - they know the costs, because it's the same drugs that destroyed Dante's Mother's life and injured Dante's heart in the first place. Now they have to figure out what to do.